Recent studies suggested that leptin as a mitogenic factor might play an important role in the process of initiation and progression of human cancer. Therefore, it could be considered as a target for breast cancer therapy. A previous study has showed that expression of leptin gene could be modulated by activation of estrogen receptors. Curcumin is a diferuloylmethane that has been shown to interfere with multiple cell signaling pathways and extensive research over the last 50 years has indicated this polyphenol can both prevent and treat cancer. Based on the fact that targeting of leptin could be considered as a novel strategy for breast cancer therapy, the aim of this study is the investigation of potentiality of curcumin for inhibition of leptin gene expression and secretion, and also, its link with expression of estrogen receptors. 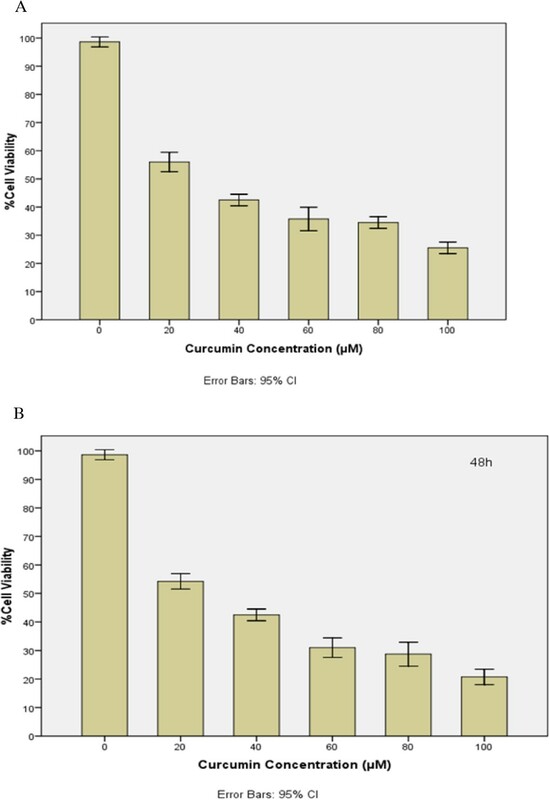 Cytotoxic effect of curcumin on T47D breast cancer cells was investigated by MTT assay test after 24 and 48 treatments. Thereafter, the cells treated with different concentrations of curcumin. The levels of leptin, estrogen receptor α and estrogen receptor β genes expression was measured in the treated and control cells by Reverse-transcription real-time PCR. Amount of secreted leptin in the culture medium was also determined by ELISA in both treated and untreated cells. Finally data were statistically analyzed by one-way ANOVA test. Analysis of MTT assay data showed that curcumin inhibits growth of T47D cells with dose dependent manner. There were also significant difference between control and treated cells in the levels of leptin, estrogen receptor α expression levels and the quantity of secreted leptin that both were decreased in the treated cells compared with control cells. Based on the results, curcumin inhibits the expression and secretion of leptin and it could probably be used as a drug candidate for the breast cancer therapy through the leptin targeting in the future. Breast cancer is one of most commonly diagnosed types of cancer among women in 2012 and expected to account for 29% (226,870) of all new cancer cases among women . Many factors are involved in the breast carcinogenesis, including adipocytokines like leptin . Leptin, a 167 amino acids hormone with a molecular mass of 16 kDa, is mainly secreted from adipose tissue . It has central roles in the control of satiety, energy expenditure, food intake, many reproductive processes , affecting the metabolic and hematopoietic systems . Beside the synthesis by adipose tissue as the main source , there have been identified other sources of leptin in the body including testicles , ovaries , placenta , cartilage and bone cells , skeletal muscle  and stomach . Furthermore, the mitogenic, transforming or migration-induced properties of leptin have been revealed in many different cell types such as smooth muscle cells , normal and neoplastic colon cells [13, 14]; and also normal and malignant mammary epithelial cells [15, 16]. It has been shown that leptin induces growth and transformation in T47D breast cancer cells unlike normal breast epithelial cells . Leptin acts through binding to its receptor known leptin receptor (ObR) located in the target cell membrane . Significantly higher levels of both leptin and ObR expression have been found in cancer tissue relative to non-cancer epithelium . Also, numerous breast cancer cell lines such as MCF-7 and T47D could express leptin and ObR . All these observations confirm that leptin can act not only by endocrine and (or) paracrine action on mammary tumor cells, but also via an autocrine pathway. Additionally, a significant positive correlation has been obtained between leptin and ObR expressions with breast cancer tissue . Therefore, this paracrine-autocrine leptin axis could become a target for leptin-inhibiting drugs in cancer treatment and prevention. Results of a study showed that the ratio of ERα to ERβ, in human adipose tissue, was significantly correlated with the level of serum leptin in vivo . Thus, ERα and ERβ maybe have different roles in the regulation of leptin expression. Curcumin (diferuloylmethane), a derivative of turmeric is one of the most commonly used and highly researched phytochemicals. It exhibits promising pharmacological activities and has demonstrated beneficial effects in terms of cancer cell proliferation, growth, survival, apoptosis, migration, invasion, angiogenesis, and metastasis . Considering important roles of leptin in the breast cancer biology, in this study we investigated the possible variations in the leptin secretion and expression as well as expression of ERs in the T47D breast cancer cell line after its treatment with pure curcumin. Our study has been conducted on cell lines and it is compatible with Helsinki ethical codes, and it has been approved by ethics committee of our institute. Curcumin (Sigma, Germany), MTT (Sigma, Germany), Leptin ELISA kit (Labor diagnostika nord gmbh & co. kg, Germany), Fetal bovine serum (Gibco, USA), Phenol-red free RPMI 1640 with L-glutamine (Gibco, USA), T47D cells (Pasteur Institute of Iran), Sodium bicarbonate (Merck, Germany), Penicillin (SERVA, Germany), Streptomycin (Merck, Germany), Amphotericin B (Merck, Germany), TRIZOL Reagent (Invitrogen, USA), First-Strand Synthesis kit (Fermentas, USA), Syber Green-I reagent (Fermentas, USA). T47D cells were cultured in RPMI1640 (with glutamine) supplemented with 10% FBS, penicillin, streptomycin and amphotericin B and incubated at 37°C in a humidified atmosphere containing 5% Co2. 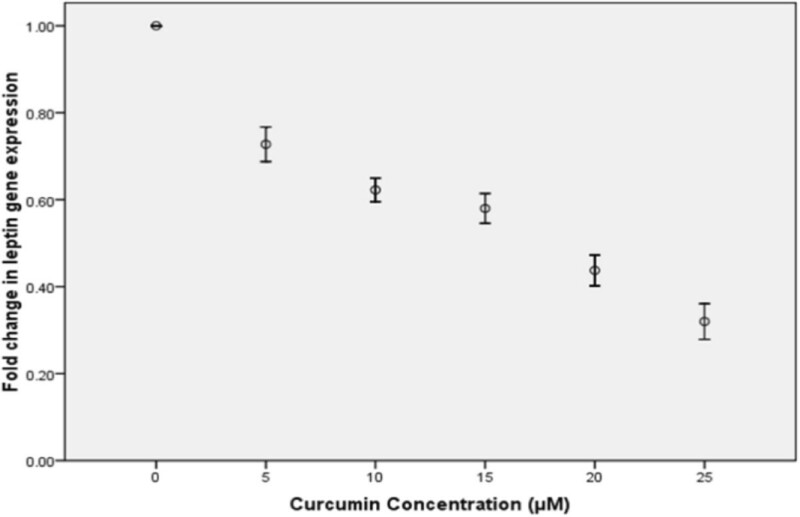 The cytotoxic effect of curcumin on T47D cells was studied by 24 and 48 MTT assays. Briefly, 2500 cell/well were cultivated in a 96 well culture plate. After 24 h incubation in 37°C cells were treated with different concentrations of curcumin (0 to 100 μM) for 24 and 48 h in the quadruplicate manner. Then, medium of all wells were removed carefully and 50 μl 2 mg/ml MTT was added to each well and incubated for 4.5 h, followed by addition of 200 μl DMSO. Thereafter, Sorensens’ glycine buffer was added and absorbance of each well was read at 570 nm. For data analysis, mean OD of each well was calculated. Then, percent of cells viability was calculated according to this formula: percent of cells viability = mean OD of test wells/mean OD of control wells × 100. Finally, a graph was plotted using SPSS 16.0 and IC50 of curcumin on T47D was determined on graph . For studying the inhibitory effect of curcumin on leptin, ERα and ERβ expression as well as leptin secretion, 1×105 cells/wells were treated in a 6-well plate with different concentrations of curcumin (0, 10, 20, 30 and 40 μM) for 24-48 h. A control group containing 0.1% DMSO without curcumin served as vehicle control. Total RNA was extracted from attached cells using TRIZOL Reagent according to the manufacturer’s instructions. The concentration of prepared RNA was measured using a NanoDrop spectrophotometer (Termoscientific, USA) and its integrity was confirmed by electrophoresis on 1.5% agarose gel containing 1% formaldehyde. After RNA preparation, cDNA was synthesized using the First-Strand Synthesis kit according to the manufacturer’s instructions. The synthesized cDNA was immediately used in a real-time PCR or stored at −70˚C for later use. The real-time PCR was used for measurement of leptin, ERα, and ERβ expression levels in the control and treated cells. β-actin gene expression was used as the internal control. The real-time PCR reaction was done using the Syber Green-I reagent in the Rotor Gene 6000 system (Corbett research, Australia) according to the manufacturer’s instructions in a triplicate manner. The amplification conditions were as follows: leptin (2 min at 95°C and a two-step cycle of 95°C for 15 s and 60°C for 40 s for 40 cycles), ERα (5 min at 95°C and a two-step cycle of 95°C for 30 s and 57°C for 40 s for 40 cycles), and ERβ (5 min at 95°C and a two-step cycle of 95°C for 15 s and 64°C for 40 s for 40 cycles). Sequences of used primers were shown in Table 1. Changes in leptin, ERα, and ERβ expression levels between the control and treated T47D cells were calculated by the 2–ΔΔCT method. For analysis of possible effect of curcumin on amount of secreted leptin in the treated cells compared with the control cells, leptin concentration was measured in the supernatant media of cells using a human leptin ELISA kit according to the manufacturer’s instructions. Statistical analysis was performed with SPSS 18.0 software. Data are expressed as mean ± standard deviation. All experiments were performed in triplicate. The differences in expression levels of leptin, ERα and ERβ as well as quantity of secreted leptin between the control and treated cells were analyzed by one-way ANOVA, followed by Dunett’s multiple comparison tests. A p-value <0.05 was considered as significant. 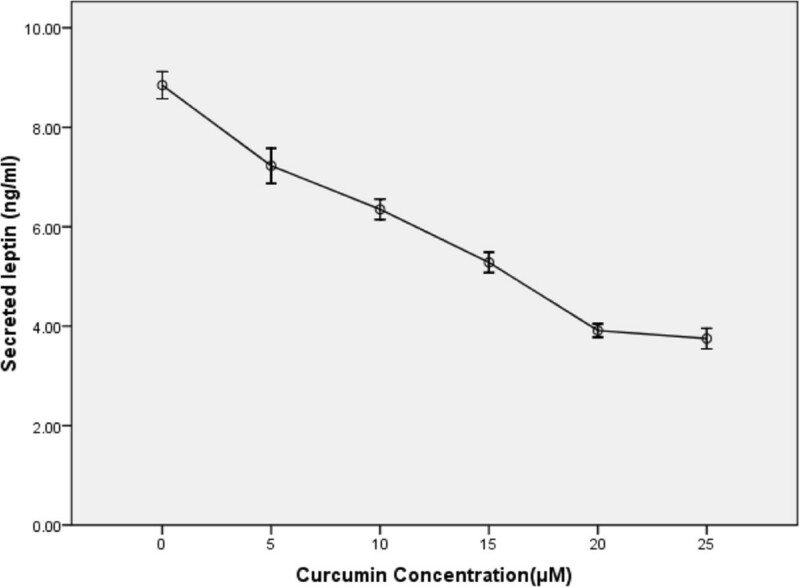 Data analysis of cytotoxicity assay showed that IC50 of curcumin on T47D breast cancer cell line was 28 and 24 μM for 24 and 48 h MTT assays, respectively (Figure 1). The obtained IC50s were dose-dependent. The cytotoxic effect of curcumin on T47D cells during 24 h (A) and 48 h MTT assays. Real-time PCR results showed a significant decrease in leptin expression in the treated cells compared to the control cells (p-value < 0.05) (Figure 2). We, also, measured the expression levels of ERα, and ERβ in the treated and control cells. Although, no significant difference was detected in ERβ expression levels between the treated and the control cells, a significant decrease was observed in the ERα mRNA level (p-value < 0.05) (Figure 3). Therefore, the ERα/ERβ expression ratio has been decreased in the treated cells compared to the control cells. There was no significant difference between the DMSO control and the DMSO-free control (the 0 μM concentration of curcumin). Effect of curcumin on leptin expression levels in T47D cells. 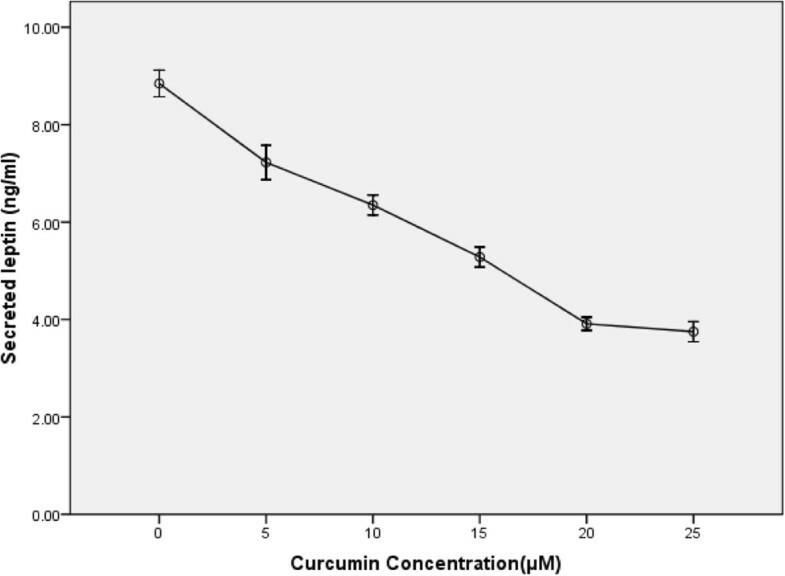 Effect of curcumin on expression levels of ERα (A) and ERβ (B) genes in the T47D cells. As the figure shows, there is a significant decrease in ERα gene expression levels with increasing in the curcumin concentration (p-value < 0.05), unlike ERβ gene expression levels. Data analysis revealed a positive significant link between leptin gene expression and ERα gene expression level and no link between leptin and ERβ expression level in curcumin treated cells compared to the control cells. In addition, a positive significant correlation was found between mRNA level of leptin and ERα/ERβ expression ratio. Amounts of secreted leptin were evaluated using ELISA. A significant difference was found between the control and treated cells in term of secreted leptin (Figure 4). This finding was in accordance with inhibition of leptin gene expression by curcumin. Effect of curcumin on leptin secretion in T47D cells. This study demonstrates that curcumin, most active constituent of turmeric , can inhibit leptin gene expression and secretion in T47D breast cancer cells and this decrease in leptin gene expression and secretion was positively associated with decrease of ERα gene expression. These results indicate that curcumin has a strong potential to interact with the expression of leptin gene, which has significant roles in carcinogenesis and proliferation of breast cancer cells . Regarding to the critical role of leptin in breast carcinogenesis , there are many attempts to inhibit leptin function and secretion. Gonzalez et al. inhibited growth of murine mammary cancer cell and xenograft tumor model of human breast cancer cell lines by leptin peptide antagonist . In addition, leptin analog mimicking its action  and anti-leptin receptor monoclonal antibody  are also another approaches for interfering with the leptin function. In the other studies, administrations of some compounds including b3-adrenoreceptor agonist, conjugated linoleic Acid, isoflavone, resveratrol and bitter melon lead to decreased secretion and lower levels of serum leptin . The current work, however, aimed to direct inhibition of leptin expression and secretion in human T47D breast cancer cell line using curcumin. Due to significant anti-cancer effects of curcumin on various types of cancers such as gastrointestinal, genitourinary, gynecological, hematological, pulmonary, thymic, brain, breast, and bone , it can be used as a chemotherapeutic agent for breast cancer therapy. The mechanisms by which curcumin exerts its anti-cancer effects are comprehensive and diverse, targeting many levels of regulation in the processes of cellular growth and apoptosis. Curcumin has an inhibitory effect on both NF-κB and AP-1 activation. curcumin has been shown to suppress the expression of a variety of NF-κB regulated gene products involved in carcinogenesis and tumor growth including cyclin D1, VEGF, COX-2, c-myc, Bcl-2, ICAM-1 and MMP-9 . In addition, Curcumin has been shown to suppress the expression of cyclin D1 in many types of cancer including head and neck, colon, bladder, breast, cervical and pancreatic carcinomas . Our results, regarding inhibition of leptin expression, confirm these findings, also demonstrating another role for curcumin effect that probably acts through estrogen receptors. It has been demonstrated that expression of leptin has positive correlation with expression of ERα and negative correlation with ERβ expression . In addition, leptin promoter has response elements for both ERα and ERβ ; where, probably competition between ERα and ERβ in attachment to this place causes reduction of leptin gene transcription by lowered activity of the leptin promoter. Nejati-Koshki and et al. reported that silibinin can decrease leptin gene expression and secretion in T47D cells thought activation of ERβ gene expression . In the current study, we showed that reduction of leptin expression by curcumin positively correlates with expression of ERα. Therefore, it seems that one of the possible mechanisms of curcumin inhibitory effect on leptin expression could be through ERs. However, many studies need to determine the exact molecular mechanism (s) involved in the reduction of leptin gene expression and secretion by curcumin [35–54]. In summary, we demonstrated that curcumin could inhibit expression and secretion of leptin in T47D breast cancer cells. Regarding to the significant roles of leptin in breast carcinogenesis, its inhibition could be considered as a novel strategy for treatment of breast cancer in the future. The authors would like to thanks Faculty of advanced medical sciences for granting and technical assistance. SWJ conceived the study and participated in its design and coordination. AA participated in the sequence alignment and drafted the manuscript. YH, and KNK helped in drafting the manuscript. All authors read and approved the final manuscript.